Patrick Priebe. Remember that name if you are a weapons lover, for this guy has some of the most amazing creations. One of his most recent weapons is the Gauss Rifle, which is supposed to derive inspiration from Crysis 2, a first-person shooter game from EA. Whether you have played the game or not, you can just imagine the array of weapons available that will get any gamer (who also has a fixation on guns) excited. Priebe has established his name by making real-life weapons drawing inspiration from various works. Lest you think what he’s doing is unethical or questionable, there is no need to be anxious as he does not make plans or blueprints available to the public. 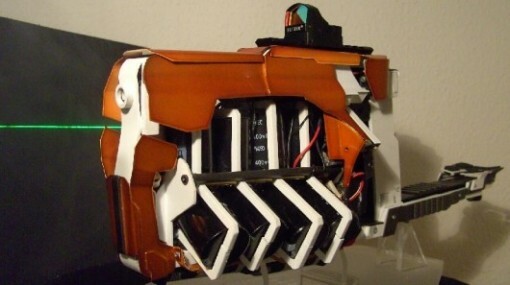 In the past, his creations such as the Pulse Laser Gun has caught the attention of people from all over. The Gauss Rifle seems to be one of Priebe’s best, though. This gun is not for sissies, trust me. Its weight alone – 7 pounds (that’s 3.2 kilos) – requires that you have some muscle power to carry that gun around. Its size is nothing to scoff at as well. It certainly will not get you past any sort of security! Capacitors, coils, and EMPs notwithstanding, here is the Gauss Rifle in action. I don’t know about you, but I was expecting more bang from the impressive looking gun. Still, I suppose that’s how laser weapons go.